Or, get it for 50000 Kobo Super Points! Endoscopic Sinonasal Dissection Guide demonstrates the most relevant techniques that enable residents to safely navigate the complex anatomy of the nose and paranasal sinuses. 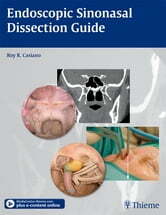 Organized in a stepwise approach and designed to mirror a residents progression in the lab, this succinct and user-friendly manual includes the most pertinent information on instrumentation, anteroposterior and postero-anterior approaches, and basic and advanced dissection techniques. Each chapter presents sagittal and endoscopic images accompanied by radiologic correlations with key anatomical landmarks highlighted throughout. This highly visual text is ideal for residents in otolaryngology-head and neck surgery and skull base surgery who are working in an endoscopic cadaver laboratory, as well as specialists who need to refresh their dissection techniques.